Beautiful day above the clouds! 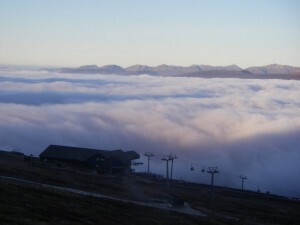 There is a temperature inversion, with temperatures of about +6°c above 600m. Because the relative humidity is low, the snow remains frozen. At 9am this morning, the relative humidity on the summit of Aonach Mor was 16% which means that the snow thought the temperature was -11°c, thus the frozen snowpack. This is of course great news for anyone who likes walking about on crisp snow with crampons on. All the old snow in the main gully lines also remains frozen, and it looks like it will remain like this for the next few days. Happy Xmas!